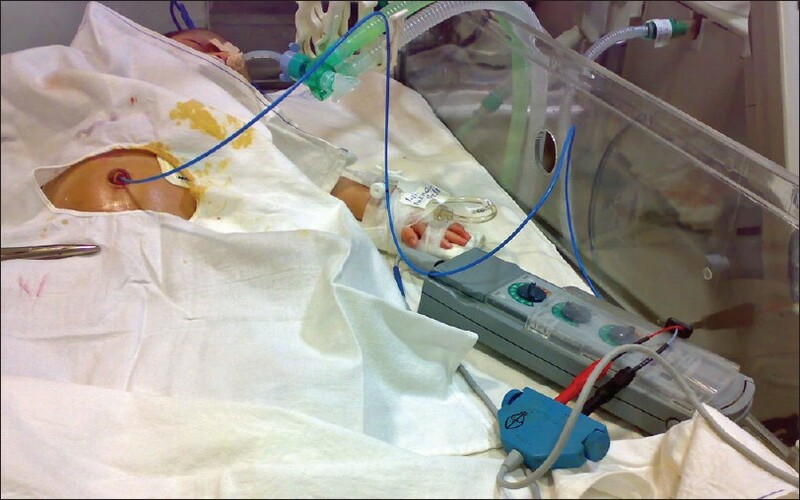 Neonatal pacing during certain arrhythmias or emergency resuscitation is underutilized because of lack of requisite catheters and access devices. Small-sized pacing wires that could be introduced through 4F or 5F sheaths are not readily available. Nor are transcutaneous pacing devices or esophageal pacing systems readily available. 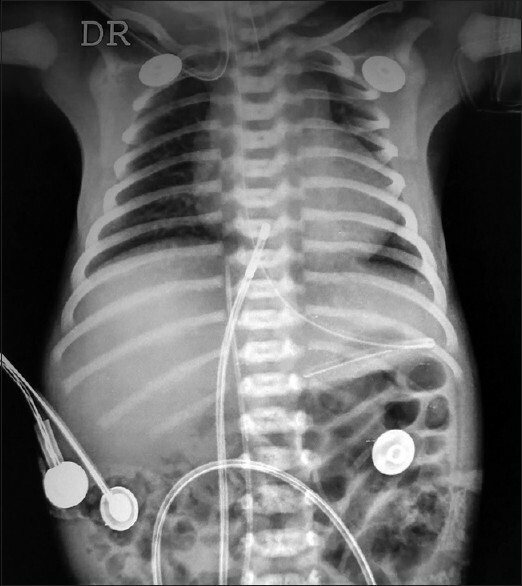 The adult pacing wires are 5F or 6F sizes and require 7F and 8F sheaths, respectively, which are not possible to be introduced in a neonate through the femoral or jugular routes. We describe a technique where the umbilical venous access was used to directly introduce the 5F or 6F standard bipolar pacing wire to achieve atrial pacing in neonates up to 3 weeks of age where emergency pacing was required [Figure 1] and [Figure 2]. This method does not require any access devices or sheaths. It is done the same way an umbilical venous catheter is introduced, but requires a little more care as the pacing wire is stiffer. The umbilical cord is premoistened with normal saline and then painted and draped as per standard protocol. The bipolar pacing wire, generally 6F, is introduced after cutting the umbilical cord at the base and identifying the opening of the umbilical vein. The wire is introduced slowly and gently, rotating it slightly if resistance is encountered before reaching the right atrium. Confirmation of placing is achieved by the presence of atrial capture rhythm on the pace maker and achieving successful pacing beats by setting the atrial rate higher than the spontaneous rate. It is primarily a blind emergency procedure, which can be done at the bedside without requirement of any fluoroscopic or echocardiographic guidance. Ventricular pacing is not possible due to the fact that the pacing wire cannot be manipulated across the tricuspid valve while using the umbilical route. Also this method would be useful only up to the initial few days of life, before the umbilical cord stump dries up. Although we did not experience any complications of the procedure in our 5 patients, it is possible that vascular damage or tear can happen if any undue force is applied during wire placement. Also other complications, such as infection and thrombosis are theoretically possible. We have done the procedure in five neonates till now, smallest being 1.2 kilograms and 32 weeks of gestation. The oldest age of the child that we could do the procedure was a term neonate 20 days of age, weighing 3.4 kg. Indications varied from sinoatrial node dysfunction due to metabolic disturbances and posthypoxic arrhythmias. One procedure had to be abandoned due to inability to advance the pacing wire up to the atria. In the 4 successful placements, we could achieve atrial capture in all four. Our method of atrial pacing is possible with the use of readily available adult pacing wires and pacemaker, and does not require any special equipment. It can be done quickly and with absolute safety if routine asepsis measures are followed as in any central line placement. It would be possible to get the same benefits if transcutaneous or esophageal routes are used, but both of these methods require special equipment and are considerably expensive. Umbilical venous route for neonatal atrial pacing has not been described until now and presents a novel therapeutic method to neonatologists and cardiologists. We describe a novel method of transumbilical venous route of atrial pacing in neonates using 6F sized pacing wire, which can be done bedside as an emergency procedure without requiring special skills or equipment. 1. Stacy AS, Fish FA. Fetal and neonatal arrhythmias. Neoreviews 2008;9:e242-52. 2. Tanel RE, Rhodes LA. Fetal and neonatal arrhythmias. Clin Perinatol 2001;28:187-207. 3. Rhodes LA, Walsh EP, Saul JP. Conversion of atrial flutter in pediatric patients by transesophageal atrial pacing: A safe, effective, minimally invasive procedure. Am Heart J 1995;130:323-7. 4. Lichstein E, Chadda K, Fenig S. Atrial pacing in the treatment of refractory ventricular tachycardia associated with hypokalemia. Am J Cardiol 1972;30:550-3. 5. Song FQ, Xie L, Chen MH. Transoesophageal cardiac pacing is effective for cardiopulmonary resuscitation in a rat of asphyxial model. Resuscitation 2006;69:263-8. Khanna, P., Arora, S., Aravindan, A., Prasad, G.